Provider of the Year Plusnet offers high-value broadband and call packages with speeds of up to 76Mb. Direct Save Telecom offer a range of value phone and broadband packages, including short-term contracts. Vodafone offers high-speed broadband deals for new and existing customers. A range of mobile broadband offers are also available. The Post Office offers UK-based service on their broadband and home phone deals. Get fast, unlimited business broadband, cheap calls and award-winning service with XLN. John Lewis offers phone and broadband deals with a range of speeds up to 76Mb. Hyperoptic offers outstanding speeds to select postcodes in the UK. Get up to 1Gb download speeds and a free wireless router. Pop Telecom offers ADSL broadband with speeds of up to 17Mb at low prices. SSE offers broadband with speeds of up to 76Mb, unlimited downloads and call packages. Relish broadband offers Central London super-fast 50Mb wireless broadband without a landline, meaning no line rental costs. Origin Broadband offers broadband and phone packages complete with truly unlimited usage, a free high-end router, and speeds of up to 66Mbps. Energy company First Utility now offers ADSL and fibre broadband, with speeds of up to 76Mbps and unlimited downloads. Now Broadband offers flexible TV, broadband and home phone bundles, with the option to add Entertainment channels. Onestream offers Unlimited Broadband and great value call plans, they also specialise in cost-effective Broadband and Fibre deals. Big Blu's broadband options mean that anyone can enjoy superfast internet anywhere in the UK – and that includes even the remotest rural villages – from just £27.99 per month. Energy company Shell now offers ADSL and fibre broadband, with speeds of up to 76Mbps and unlimited downloads. This is uSwitch's broadband provider directory, where we've outlined the UK’s major broadband companies and provided a brief summary of who they are and what they offer. There are over 150 broadband providers in operation in the UK, so for obvious reasons, we're only able to list the UK's biggest broadband companies on this page. Broadband providers come in all shapes and sizes. There are a few very large broadband providers, such as BT and Virgin Media, as well as a host of smaller suppliers. Each have their own pros and cons for their ability to meet your broadband needs. The sheer range of broadband providers can be slightly overwhelming. This is where broadband comparison sites come in handy, offering you a great way to compare lots of broadband packages at once in a single location, saving you a lot of time and effort. At uSwitch, we try to help you to choose the right broadband provider for your needs by giving you relevant information on each provider and listing their packages in an easy-to-understand, concise way. If you'd rather compare broadband providers available to you at a broadband package level, you can use our postcode checker. This allows you to see which deals are available to you in seconds. 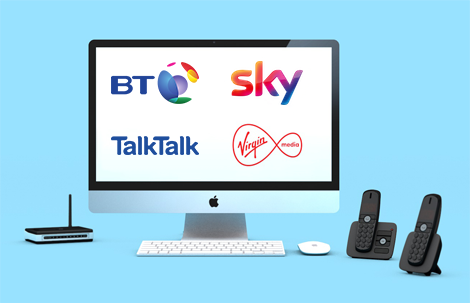 TalkTalk is a large broadband provider and offers great-value fibre and ADSL broadband services, as well as home phone and pay-TV via the YouView platform. EE offers impressively fast 4G mobile broadband and fibre home broadband. EE mobile customers benefit from purchasing EE home broadband as they can potentially boost their data plans. BT is the largest broadband provider in the UK, with several tiers of fibre broadband services and a cheaper ADSL option for customers to choose from. It also offers pay-TV, the major selling point of which is BT Sport and its live coverage of the Premier League, as well as exclusive UEFA Championship matches. Virgin Media Virgin Media offers premium cable broadband and TV bundles and consistently delivers high-speed broadband through its cable etwork. Plusnet is a value ISP that offers affordable fibre and ADSL broadband packages to customers alongside excellent customer support. Sky is one of the biggest digital TV providers and also offers broadband and home phone services as part of broadband bundles. Vodafone is a mobile phone operator turned broadband provider. Vodafone offers a range of excellent value broadband packages, particularly its fibre broadband deals.